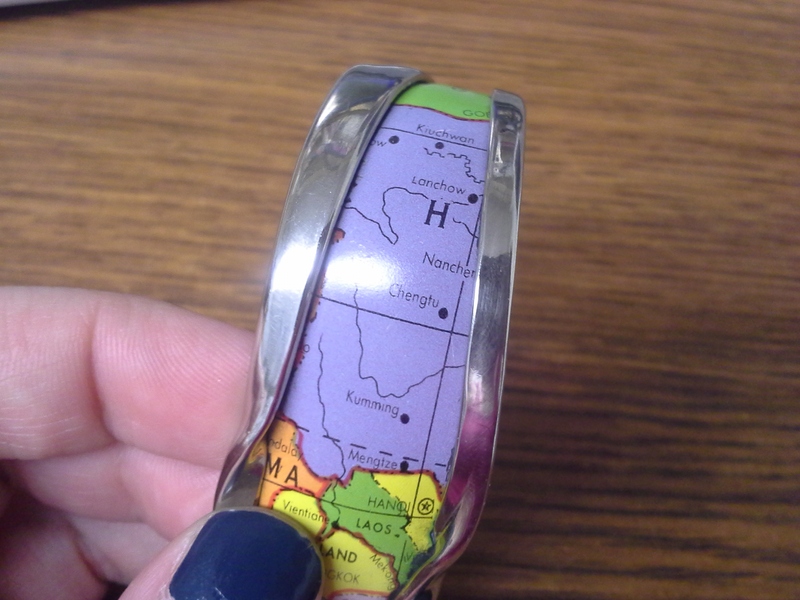 I got this cool bracelet recently. 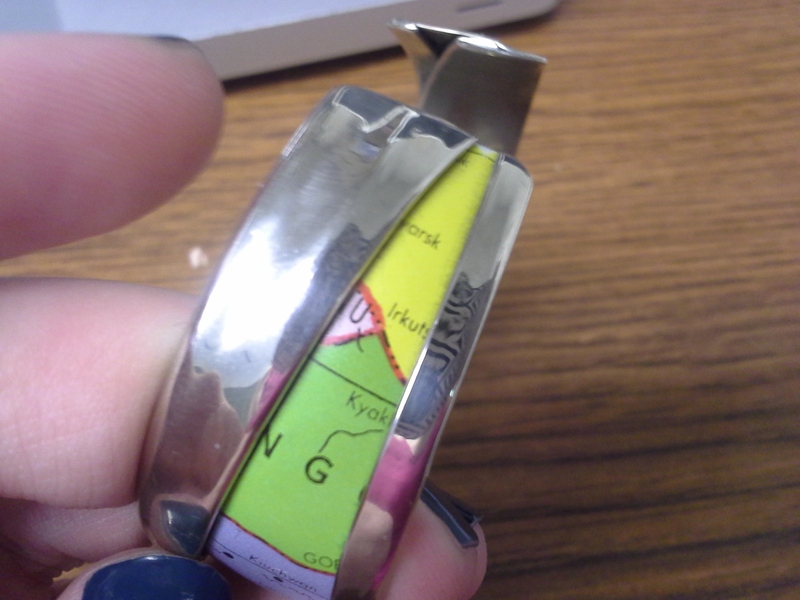 It’s made with part of an old globe. 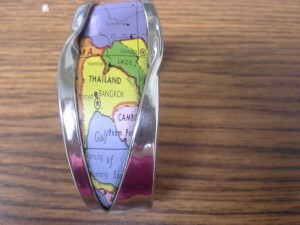 I bought it both because I like maps and because it has Thailand, Cambodia, and Laos on it, and we took a trip there last year. Little did I know when I bought it, the bracelet also contains a geography mystery. Towards the top, there’s a little sliver of pink between Mongolia and Russia (or more likely, the USSR), and I don’t know what it is. Its name seems to end in “nu,” and I think it’s currently in Russia, but it might be part of Mongolia. It’s too far east to be Kazakhstan. Thailand is called Thailand, so the globe is probably from between 1939 and 1945 or after 1949. I can just barely see a border on the western part of China, just north of Burma. I believe this means Tibet is in a separate color from China, so the globe is probably from before 1951. The Gulf of Thailand is called the Gulf of Siam. I’m not sure what that tells me about the date of the globe. I can’t tell enough about the Laos-Vietnam border for that to help me, but maybe someone else can. The Chinese city names that I can read are spelled Kiuchwan, Lanchow, Chengtu, Kumming, and Mengtze. Xiongnu are Tannu Uriankhai are both historic names from the region, but neither one was in use after 1921. On the far left north of Burma, you can just barely see a border that I think is Tibet. So I have three questions. First: what is that region? Would English language cartographers have used the name Tannu Uriankhai that late? Second: can we narrow down a likely date for this globe? Third: is there a good reference somewhere for the history of place names? I feel like it shouldn’t be that hard to learn when English language cartographers would have called the Gulf of Thailand the Gulf of Siam, but I couldn’t find it easily. Thanks. It’s interesting that only Mongolia and the USSR recognized it, but some US globes and maps had it. I guess the combination of Tannu Tuva and Thailand means the globe was likely produced between 1939 and 1944. I also just noticed that the border between Laos and Vietnam is not outlined in red like the borders between other countries, so I think they might have been subdivisions of French Indochina on the map. That also supports the globe being from before 1945.